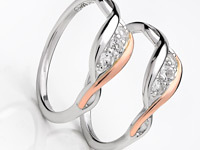 These terms and conditions govern your use of www.clogau.co.uk (the ‘site’) and the purchase of goods and services from Clogau including the Clogau stores at Bangor, Resorts World Birmingham, Bridgend, Broughton, Cardiff, Cheshire Oaks, Llandudno, Swansea and Westfield London. Here, you will also find information on orders and returns, your privacy and your security on the pages of the site and these pages shall be incorporated into these terms and conditions. If you have any questions, please contact us. In these terms and conditions, "we", "us", "our" and Clogau means Clogau Gold of Wales Limited. You must be 18 years of age or older to purchase goods from the site. If you are under 18, you may use the site only with the involvement of a parent or guardian. Your use of and registration on the site is void where prohibited. We offer all of our direct customers (excluding retailers) a 14-day "no quibble" money-back returns policy: if for any reason you are unsatisfied with your Clogau jewellery, you may return it unworn and in its original presentation packaging, and within 14 days of receipt for a full refund or exchange. For all returns, except where the item is faulty or dispatched in error by us, you will be required to arrange and pay for the return of the products to us, we do not offer refund on postage. Where the item is faulty or dispatched in error, Clogau will only reimburse returns made within the UK (excluding international) after the item(s) has been assessed by us. We cannot exchange or refund earrings (for hygiene reasons), engraved or soldered items (unless they are defective or faulty), or vouchers (whether physical vouchers or e-vouchers). Also, please note that earrings can only be purchased as a complete pair (two earrings), and we are unable to supply a half pair for purchase. This returns policy only applies to items purchased via Clogau directly (website, telephone or mail-order). Items purchased via an approved Clogau retailer must be returned to its original place of purchase. Promotions: If you wish to return your original item(s) you must also return the free item. Any item(s) that is returned without a promotional item(s) that was included with the original transaction will have the value of the promotional item deducted from the refund amount. If you purchased a discounted item, you will be refunded the price paid on purchase, and not the RRP. When returning items you must obtain proof of posting as we cannot accept responsibility for parcels lost in transit. Furthermore, returns must be made via a postal service which carries a level of insurance cover that is adequate to cover the full cost of replacement. Please contact your local post office to enquire what services and insurance levels are available, as these do change from time to time. For all returns, except where the item is faulty or dispatched in error by us, you will be required to arrange and pay for the return of the products to us. Where the item is faulty or dispatched in error, Clogau will only reimburse returns made within the UK (excluding international) after the item(s) has been assessed by us. For more information regarding making a return, please see our returns page. Our customer care number is 0345 606 88 77 and our representatives are available 9.00am to 5.00pm (GMT/BST) Monday to Friday. Please note that calls may be monitored or recorded, and that call charges from landlines and mobiles may vary. Please refer to your service provider for all charges. We accept VISA, MasterCard, Visa Debit, Switch/Maestro, Delta, Solo, Electron. Due to problems with authorisation on credit cards for customers outside the UK, we require such customers to pay by BACS or PayPal. However, as a result of the bank charges incurred for BACS payments, each transaction from an international customer will incur a £15 charge on top of the order value. If you wish to avoid this fee, please place your order via PayPal. Please don't try to send orders via email, as we cannot guarantee any secure transmission of details. We will take all reasonable care to keep your order secure, but in the absence of our sole negligence we cannot be held liable for any loss you may suffer if a third party obtains unauthorised access to any data (including credit and account details) you provide when accessing or ordering from the site. If you're still worried about security over the Internet, please contact us by phone. All bespoke items cannot be returned for refund or exchanged unless deemed faulty. All rings, bespoke or otherwise, maintain the same dimensions regardless of finger size, and the motif/pattern or any other detail will be unchanged. The only difference will be the inner diameter of the ring. The Clogau two-year manufacturer warranty covers jewellery and watches purchased directly from Clogau or from an approved Clogau stockist*. To be eligible for the warranty, (1.0) the purchaser or recipient must register the item(s) by (1.1) completing the online form at www.clogau.co.uk/warranty (1.2) or by filling in and returning the Extended Warranty Form (1.3) within 30 days from the date of purchase. (1.4) To obtain service under the warranty proof of purchase is required. (1.5) Should Clogau receive warranty registration after 30 days from the date of purchase (which can be later verified with proof of purchase), the item(s) will be covered by our standard one-year manufacturer warranty. (2.0) When registering for Extended Warranty online, confirmation of registration will be provided to you. When registering by post, however, confirmation will not be provided. (3.0) The warranty covers Clogau jewellery manufacturing faults and watch movement parts specifically against mechanical failure, (3.1) Clogau reserves the right to determine the validity and nature of each warranty claim. (3.2) Should your jewellery or watch prove defective within two years, at our discretion, you will be entitled to (3.3) a repair free of charge or a replacement with: (3.4) the same item or (3.5) replacement with a succeeding item if the returned item has been discontinued or (3.6) an exchange for an item of the value stated on the receipt or (3.7) Gift Vouchers to the same value will be applicable (3.8) The warranty does not apply if the jewellery or watch exhibits: (3.9) normal wear and tear, (3.10) resize or alteration, (3.11) accidental or wilful damage, (3.12) misuse by any party, (3.13) repair by a third-party, (3.14) failure to follow Clogau jewellery care guidelines. (3.15) Clogau watches can withstand accidental splashing. Watches are not covered if submerged during swimming or bathing. (3.16) The warranty does not cover the replacement of watch: (3.17) batteries, (3.18) crystal glass, (3.19) straps, (3.20) crowns, (3.21) bracelets. (4.0) If your warranty covered item has been repaired by Clogau, you do not need to re-register for warranty, as the original cover still applies. 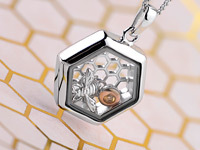 (5.0) Clogau jewellery and watches bear unique hallmarks and marks. Without these marks the warranty is void. *(6.0) Refund on an item not directly purchased from Clogau must be addressed to the point of sale of the approved Clogau stockist from where the item was originally purchased. Where this is not possible, we will offer a replacement or gift vouchers to the value of if within warranty period. (7.0) Perfume is exempt from warranty. (8.0) Please note that our warranty policy does not cover items that have been lost. (If you have lost an item we recommend you contact your home insurance company). Please see our delivery page for information on timings and costs of delivery. We will use all reasonable endeavours to deliver the goods or services within the times indicated. However, where delivery times and dates are given, they are for general guidance only and we will not be held liable for late delivery of goods caused by circumstances beyond our reasonable control. Unfortunately, it is not possible to specify a delivery time. 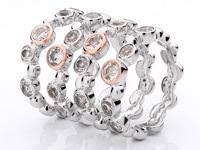 All guarantees provided are by our courier services, and not Clogau. Orders placed before 4pm on a Friday will be delivered on a Monday (excluding bank holidays). We shall attempt to deliver the goods to the address you specify for delivery, or if none, to the credit card address you supply. You are responsible for making arrangements to receive the goods and if the goods are held at the post office or other delivery company's depot, because no one was available when the goods were delivered, then it is your responsibility to swiftly collect the goods. It is important that the addresses supplied by you to us are accurate. Please note that our next-day delivery service is provided by Royal Mail who use a track-and-trace method to confirm receipt of delivery. Royal Mail, shows the signed signature on proof of delivery. We maintain responsibility to obtain any signature as a proof of delivery from the delivery address provided by the customer at time of transaction. Any signature obtained on delivery will be accepted as valid. We do not take responsibility for releasing goods to an unauthorised signatory at the delivery address. If for any reason, a customer’s goods are misappropriated, we will obtain a proof of delivery from Royal Mail or FedEx in order to assist the customer to resolve the issue. It is the sole responsibility of the recipient of the parcel to inform us of any discrepancies relating to the contents, i.e. missing or incorrect item received, within 7 days of receiving the parcel. We will not be held liable for any discrepancies informed after this time. For customers in the United Kingdom and European Union customers (not registered for VAT), the prices you pay includes any duties or taxes applicable to the UK and the remainder of the European Union. If duty rates change, we reserve the right to charge extra or not to supply. It may not be possible for us to deliver to some countries, if an order is received with a delivery address outside the territories stated, you will be contacted by our customer service centre. For customers outside the UK and European Union the RRP price is exempt of VAT, but is a fully landed cost (to include RRP), we say this as it includes administrative charges to handle an overseas item. It is the customers responsibility to provide the correct information, with regards to home country, during the ordering process so that the applicable price can be charged. Please bear in mind that to ship a package overseas involves a courier service (in our case, FedEx International) as well as insurance and administration costs which are reflected in the RRP price to overseas customers. All orders from outside of the UK will occur an additional postage cost, please see the International Delivery section on the Dispatch page. All orders to non-UK countries are charged £30 and are posted by FedEx International. Please note that it is the customer’s responsibility to accept delivery of Fedex International parcel by means of signature with the courier, and paying all duty and other taxes arising in the country that products have been shipped to. These charges can range from 5-25% depending on the country. If a parcel is refused by customer, Clogau will not accept responsibility and the parcel will not be returned to us and will remain undelivered and no refund will be issued to customer. If returning a parcel to us from outside of the UK, it is the responsibility of the customer to pay own shipping costs and any duties and taxes that may arise. Goods outside Europe are delivered at standard UK RRP on a Free On Board basis. Customers are responsible for all further costs which may result after the goods arrive in the destination country. For supplies of goods in Europe, VAT is charged at standard rate. Unfortunately, we are unable to supply any liquid form product - i.e., perfumes and fragrances - to any overseas address. We can only supply to addresses within the UK. Following your online order you will receive an order confirmation via email. It is the sole responsibility of the recipient to inform Clogau of any discrepancies relating to the contents, i.e. missing or incorrect items ordered, within 7 days. Clogau will not be held liable for any discrepancies informed after this time. With every order of £59 or more you will receive a unique £10 online voucher code within your order confirmation email. To redeem it, you must spend £99 or more in a single order before the expiry date and enter your voucher code during your order. If your order amount comes to less than £99 your voucher code will not work. Please note that it cannot be used in conjunction with loyalty points or any other voucher or promotional offer. We offer engraving on specific products and also soldering of charms on selected bracelets and necklaces. The additional time needed for these services, if the item is in stock, is an additional 7 working days, excluding delivery. This will be longer during busier period of time. For more information, please call one of our customer service advisers on 0345 606 88 77. Our items are manufactured to a very high quality. However, should you require it, we offer a repairs service. For more information on the price and timings of this service, please call one of our customer service advisers on 0345 606 88 77 where a member of the team can advise you further. We only offer our engraving, soldering and repairs service for items that you purchase from us. All of our jewellery is hand polished and finished. 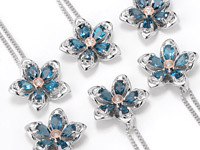 Sterling silver is used as standard except where specified. All diamonds and precious stones are hand selected for purity and colour. Diamond weights quoted are the average carat weight per piece or pair in the case of earrings or set, unless stated otherwise and this weight can fluctuate up and down slightly. All of our enamel items are epoxy resin enamel, often referred to as cold enamel. All the diamonds used in our jewellery pieces are clarity graded VS1-S1, which means that they contain only very slight to slight inclusions. With regards to the colour of the diamonds we use, they are all graded G-H which is described as near colourless. For every item containing multiple diamonds, we list the average weight. Where we state the total diamond carat weight, this may vary plus or minus 0.05 carats from the weight stated. Clogau is committed to offering high-quality diamonds. We share the public's concern regarding conflict diamonds and we only purchase diamonds which comply completely with the Kimberley Process requirements. All rings, bespoke or otherwise maintain the same dimensions regardless of finger size, and the motif/pattern or any other detail will be unchanged. The only difference will be the inner diameter of the ring. All items are supplied with either a black or white 'Clogau' tag. The beauty of our jewellery is that each piece is designed to the finest detail to really capture the essence of the story behind it; as a result the wear ability of certain pieces is different. For example a wedding ring is designed to be worn every day and can cope with hard wear and tear, on the other hand a delicate filigree ring will not fare well if subjected to the same wear as a wedding ring. For the more delicate jewellery the design can be more creative and stylish as they are designed most for occasional wear, however for the hard wearing pieces the design is slightly simpler for the purpose of wearing on a daily basis. Therefore more care must be taken when wearing one of our more delicate pieces. It is also important to remember that harsh chemicals will affect all jewellery if regularly exposed to it. 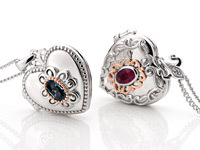 As the gemstones that Clogau uses are all natural and not synthetic there may be slight variations in appearance. This excludes certificated gemstones. All measurements and weights are approximate and have been rounded up or down to the nearest quarter-inch, centimetre, millimetre or gram. While every effort has been made to ensure these measurements and weights are correct, Clogau accepts no responsibility or liability whatsoever with regard to stated sizes or weights in or brochure or on our websites, www.clogau.co.uk and www.clogauoutlet.co.uk. 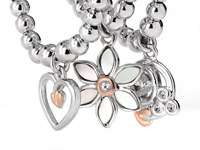 Clogau allows a 10% tolerance rate between items. If you are in any doubt about any of the sizes or weights, please either telephone us on 0345 606 88 77, email us on enquiries@clogau.co.uk or visit your Clogau stockist. The description of the goods, services, price, currency, VAT and delivery costs are set out on the order page. The advertising of products and services on this site is an 'invitation to treat'. That means your order is an offer and no contract of sale is formed between you and Clogau until you receive the confirmation of order email. Orders shall be accepted at our sole discretion but are normally accepted once credit card authorisation has been confirmed, the order reflects current pricing and stock levels. When you place an order direct with Clogau, payment is taken immediately at the point of order, whether the item(s) is in stock or not. Once we accept your order, you shall pay the price for the goods or services plus VAT and delivery and other costs specified on the order page and we shall charge your account for payment. Please keep your "confirmation of order" e-mail for your records. These terms and conditions cannot be varied except by changes made by Clogau on the site, which we may make from time to time. Proposed changes to the terms and conditions will be notified to you by e-mail or flagged for your attention when you log onto the site for a new session. Your continued use of the site after such notification shall be taken as your full acceptance of such changes. You will only own the goods you purchase once they have been successfully delivered and when we have received cleared payment for them in full. Until that time we will retain title to the goods. If you realise you have made a mistake and want to cancel your order, please contact us as soon as possible. Since we ship quickly, it may not be possible to stop your order so please follow the instructions in our 'Returns' policy section, in those instances. Please follow these instructions for exchanges as well. If your order needs to arrive to you hastily, it will be faster to re-order a product rather than send it back for an exchange, so please follow the above instructions while you order the product you would like instead. We realize this means two transactions on your credit card but feel it is faster for you to get the product you would like. Earrings can only be purchased as a complete pair (two earrings), and we are unable to supply a half pair for purchase. Pendants are purchased as a complete piece (pendant and chain), and we are unable to supply a chain only for purchase. If you should receive an item you have ordered that is defective, damaged or not what you ordered, please contact us as soon as possible. Our sales team will help you resolve any issues as quickly as possible by delivering another item, replacing your order or refunding the amount paid. Jewellery and watches on this website are not shown to scale for illustration purposes. All of the diamonds/gemstones used in Clogau jewellery and watches are from non-conflict countries. 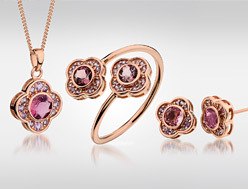 E&OE Clogau reserves the right to change prices or specification without prior notice. We reserve the right to change, modify, substitute or remove without notice any information on the site from time to time. We will endeavour to ensure that all descriptions and illustrations of the items on the site or in our catalogue or otherwise provided to you by us are accurate but there may be slight variations due to print and publishing limitations. Clogau works to keep the site up to date but cannot guarantee that this site and its contents are completely free of technical errors, viruses or anything else that may have a harmful effect on any technology. We will endeavour to allow uninterrupted access to the site but access may be suspended, restricted or terminated at any time. By using this site, you acknowledge that you assume full responsibility for all costs associated with all necessary servicing or repairs of any equipment you use in connection with this site. If you have a valid claim in respect of any of the goods which is based on any defect in the quality or condition of the goods, we shall be entitled to replace the goods (or the faulty part in question) free of charge or, at our sole discretion, refund to you the price of the goods (or a proportionate part of the price). If you have a valid claim based on the quality of any repairs we make to your goods, then we shall be entitled to rectify the defect free of charge or, at our sole discretion refund to you the price for the repair of the goods. We are not responsible for damage to items before the jewellery was in our possession or for any sentimental or other unknown value of the items. We will not be liable for loss of or damage to any item left for repair which you do not reclaim within 6 calendar months, or for the receipt for the item if it has been lost or cannot be produced. Customers are legally entitled to cancel an order within 7 working days of receipt of the product and to return it for a full refund. However, our 14-day money-back returns policy extends your ability to return an unsatisfactory online purchase for up to 14 days. Clogau cannot guarantee that the sale and delivery of its goods to your particular country or location is permissible, so please be aware of your own geographic import restrictions. 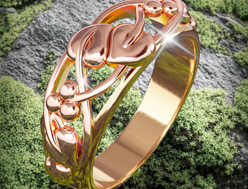 This site and its contents will not constitute the basis for any contractual commitment between Clogau and any prospective customer in any jurisdiction in which the solicitation of interest or the offering of or sale of products by Clogau would contravene any applicable local, regional or national legislation. No prospective customer should seek to make any order through the site from jurisdictions in which it would be illegal for Clogau to sell products. Your use of this site and any contract between you and Clogau for the sale of products shall be governed by and shall be construed in accordance with the laws of England and Wales and shall be subject to the non-exclusive jurisdiction of the Courts of England and Wales. If any provision of these terms and conditions shall be unlawful, void or for any reason unenforceable, then that provision shall be deemed severable from these terms and conditions and shall not affect the validity or enforceability of any remaining provisions. If we fail to enforce a right under these terms and conditions, that failure will not prevent us from enforcing other rights, or the same type of right on a later occasion. Clogau Gold of Wales Limited is registered in England and Wales under registered no 2146156 and whose registered office is at Sherbrooke House, 5 Kinmel Park, Abergele Road, Bodelwyddan, Denbighshire, LL18 5TX, UK and who all trade under the name "Clogau Gold of Wales Limited". The VAT registration number for Clogau Gold of Wales Limited is 713 6009 65. 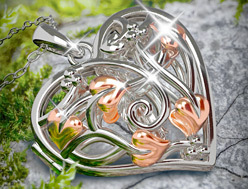 All materials, including images, illustrations, designs, site layout, photographs, written and other text or script that are part of this site together with all software compilations, underlying source code and software in the site are protected by copyright, trade mark, design right, and/or other worldwide intellectual property rights and are owned or controlled by or licensed to Clogau. All rights are reserved. The contents of the site and the site as a whole are intended solely for personal, non-commercial use. You may download or make a single copy of the contents and other downloadable materials displayed on the site for the sole purpose of placing an order with Clogau or using the site as a shopping resource. No right, title or interest in any downloaded materials or software is transferred to you as a result of any such downloading or copying. You may not reproduce (except as noted above), publish, transmit, distribute, display, modify, create derivative works from, sell or participate in any sale of, or exploit in any way, in whole or in part, any of the contents, the site, or any related software without our express prior written permission. Goods offered at sale price on the site may have been on sale in the Clogau Outlet store at the higher price for a period of no less than 28 days. If you wish to return an item purchased at sale price, please refer to the 14-day money-back returns policy. Gift voucher purchases do not qualify for promotions where a free item is given with a specified minimum spend. The free item can only be given on redemption of the gift voucher(s) as long as the other terms and conditions of the offer are met. Goods offered at the promotional price on the site have been on sale in either in the Clogau Outlet store or on the site at the higher price for a period of no less than 28 days. These items are available for customers residing in the UK, Europe and some countries worldwide (exceptions do apply). All promotions and offers run by Clogau (to include the outlet stores) are subject to terms and conditions. Offers are subject to stock availability, can not be substituted for cash or equivalent, cannot be used in conjunction with other offers unless stated otherwise and are time limited. Clogau reserves the right to amend or foreclose any offer without notice or correspondence. 1. Offer begins and closes at time stated, or while stocks last – whichever comes first. 2. A minimum spend (excluding purchases of gift vouchers) may be required in order to qualify for the offer. 3. The free item offered is stated. In the event of unforeseen circumstances, Clogau Gold of Wales Ltd has the right to substitute alternative prizes or, in exceptional circumstances, to amend or foreclose the offer without notice. No correspondence will be entered into. 4. Offers are available on a first-come, first-serve basis only, and subject to availability. 5. If you wish to return your original item(s) you must also return the free item. Any promotional item that is not returned, the value of this item will be deducted from the refund amount. 6. Offer available only when you place an order direct with Clogau Gold of Wales Ltd by placing an order via one or more of the following: www.clogau.co.uk, by phoning 0345 606 88 77, by using an order form, via a Clogau outlet stores, and/or via selected stockists' Clogau websites (which all have "clogau.co.uk" at the end of their domain name) 7. Only one free item offered per order. 8. No equivalent – cash or otherwise – will be given. 9. The offer cannot be used in conjunction with other offers. 1. Voucher expires at the time and date stated. 2. Only one voucher per order. 3. Voucher can only be used once. 4. Voucher cannot be used in conjunction with any other offers. 5. Vouchers cannot be used against Compose by Clogau® item, bespoke items, accessories, Forager’s Clogau Reserve Gin, postage, gift vouchers or gift wrap. 6. Order total may be required to meet a minimum amount before the voucher can be applied. 7. No equivalent – cash or otherwise – will be given. 8. Can only be used when ordering direct from Clogau and not through any of our stockists. 8. Free vouchers cannot be used to purchase paid-for vouchers. Prize draws are open only to UK residents aged 18 years or over, with the exception of employees of Clogau Gold of Wales Ltd, their families, agents and anyone else connected with this promotion. No purchase necessary. All registrations must be complete by stated time and date to be valid entries in the draw. Entries must be made by following the instructions provided. Registration completion is based on the necessary information being provided. The prize draw will take place at the stated time and date. Entrants may not win more than one prize. Winners will be drawn independently and at random from all valid entries received and will be notified by email or mail within a stated time after the actual draw date. The judge's decision is final and correspondence will not be entered into. The winner agrees to take part in reasonable post event publicity and to the use of their name in such publicity. The prize must be redeemed by the stated time and date. No extension is available. If the prize is unclaimed after this time, it will lapse and the Promoter reserves the right to offer the unclaimed prize to a substitute winner selected in accordance with these rules. The prize is subject to availability. In the event of unforeseen circumstances, the Promoter reserves the right (a) to substitute alternative prizes of equivalent or greater value and (b) in exceptional circumstances to amend or foreclose the promotion without notice. No correspondence will be entered into. The prize is strictly non-transferable. The prize is not redeemable for cash or exchange. The prize cannot be used in conjunction with any other discounts or special offers. By entering the prize draw, entrants agree to be bound by these terms and conditions, rules, and by any other requirements set out in promotional material. The Promoter will use any data submitted by entrants only for the purposes of running the prize draw, unless otherwise stated in the entry details. By entering this prize draw, all entrants consent to the use of their personal data by the Promoter for the purposes of the administration of this prize draw and any other purposes to which the entrant has consented. We respect the accuracy, privacy and security of your personal data. For more information, see our Data Protection Notice. Entries not submitted in accordance with the rules or incomplete will be disqualified. No liability shall be taken for entries lost, damaged or delayed in transmission. Clogau accepts no responsibility for participants being unable to participate in the prize draw, or if their entry is late or lost. The Promoter is Clogau Gold of Wales Ltd, Sherbrooke House, 5 Kinmel Park, Abergele Road, Bodelwyddan, Denbighshire, LL18 5TX, UK. Tel: 0345 606 88 77. Email: enquiries@clogau.co.uk. Registered in England and Wales, number: 2146156.